Ok, just one more frozen Calvary post… and apologies for the sparse presentations this week, a dear friend of the Pentacle has been hospitalized and I’ve been spending a good amount of time visiting with and attempting to take some of the load off of the immediate family. Such is the price of true fealty and companionship, this duty to “be there” when the good times stop. I’m no “good time charlie”, after all. 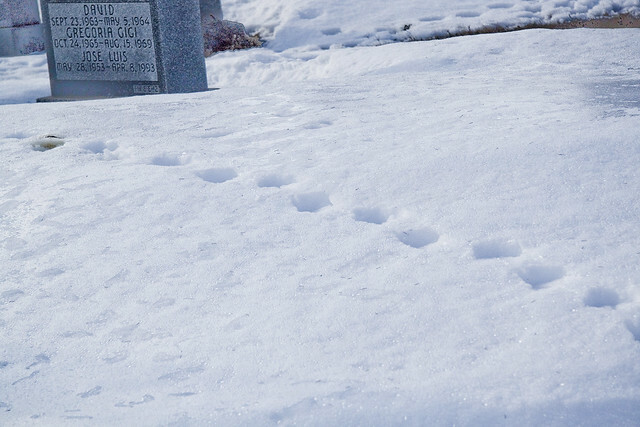 These shots are from the same walk through the ice at Calvary Cemetery discussed during a couple of last week’s transmissions . 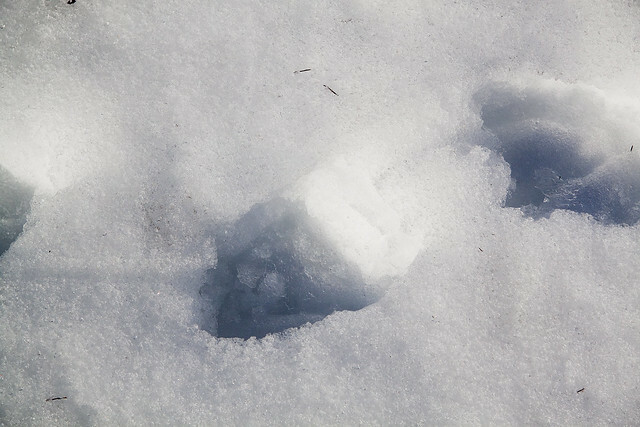 On the lookout for animal tracks (I’ll find that damned Coyote), I discovered these curious prints etching back and forth through the crusty ice and deep snow. In 1847, faced with cholera epidemics and a shortage of burial grounds in Manhattan, the New York State Legislature passed the Rural Cemetery Act authorizing nonprofit corporations to operate commercial cemeteries. Old St. Patrick’s Cathedral trustees had purchased land in Maspeth in 1846, and this land was used to develop Calvary Cemetery. 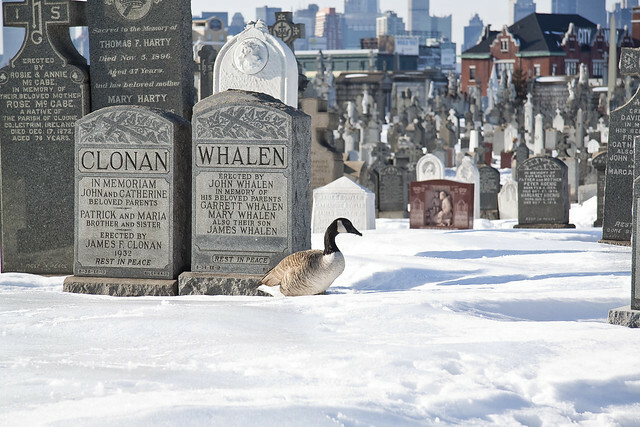 The first burial in Calvary Cemetery was in 1848 and by 1852 there were 50 burials a day, half of them the Irish poor under seven years of age. The original division of the cemetery, now known as First Calvary or Old Calvary, was filled by 1867. 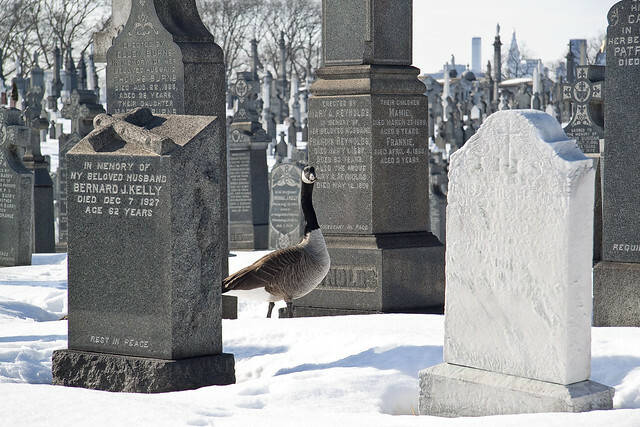 The Archdiocese of New York expanded the area of the cemetery, adding more sections, and by the 1990s there were nearly 3 million burials in Calvary Cemetery. Childhood fantasy blossomed in my thoughts, and despite the obviousness of these being bird tracks, I entertained certain vague memories of Spring Heel Jack and other Dickensian bogeymen. 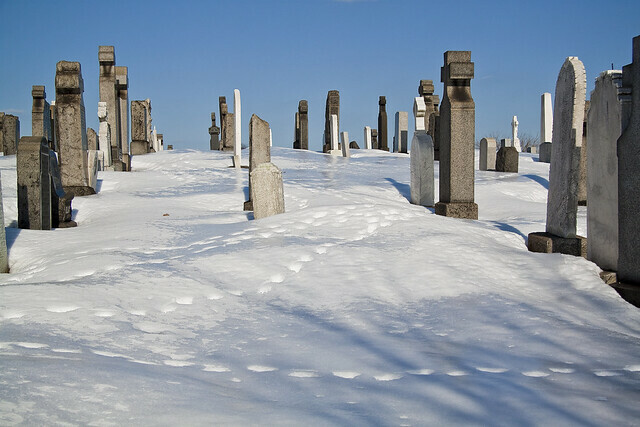 Imagine if there were some monopodal mystery hopping about the place, thought an idiot in a filthy black raincoat while standing in knee deep frozen precipitants at an ancient cemetery in Queens. Spring Heeled Jack (also Springheel Jack, Spring-heel Jack, etc.) is a character from English folklore said to have existed during the Victorian era and able to jump extraordinarily high. The first claimed sighting of Spring Heeled Jack that is known occurred in 1837. Later alleged sightings were reported all over England, from London up to Sheffield and Liverpool, but they were especially prevalent in suburban London and later in the Midlands and Scotland. Many theories have been proposed to ascertain the nature and identity of Spring Heeled Jack. The urban legend of Spring Heeled Jack gained immense popularity in its time due to the tales of his bizarre appearance and ability to make extraordinary leaps, to the point where he became the topic of several works of fiction. Spring Heeled Jack was described by people claiming to have seen him as having a terrifying and frightful appearance, with diabolical physiognomy, clawed hands, and eyes that “resembled red balls of fire”. One report claimed that, beneath a black cloak, he wore a helmet and a tight-fitting white garment like an “oilskin”. Many stories also mention a “Devil-like” aspect. Spring Heeled Jack was said to be tall and thin, with the appearance of a gentleman, and capable of making great leaps. Several reports mention that he could breathe out blue and white flames and that he wore sharp metallic claws at his fingertips. At least two people claimed that he was able to speak comprehensible English. 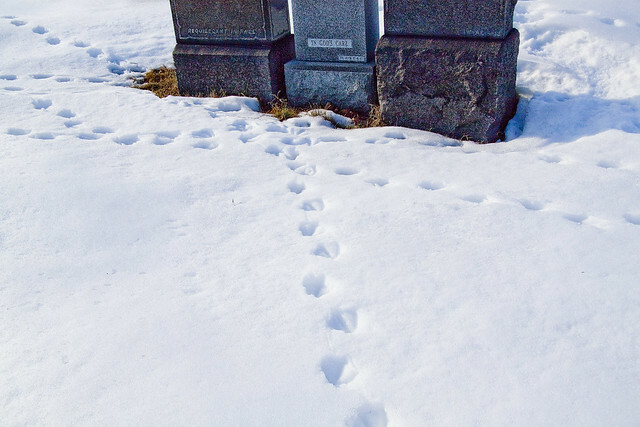 Inexpert, I clumsily followed the tracks, moving in my typically arthritic, lurching, and uneven winter scuttle. By this point, the specie which had left its mark behind was clearly avian, and quite obviously a water bird of some sort. Anatidae is the biological family that includes ducks, geese and swans. The family has a cosmopolitan distribution, occurring on all the world’s continents except Antarctica and on most of the world’s islands and island groups. These are birds that are adapted through evolution for swimming, floating on the water surface, and in some cases diving in at least shallow water. (The Magpie Goose is no longer considered to be part of the Anatidae, but is placed in its own family Anseranatidae.) The family contains around 146 species in 40 genera. They are generally herbivorous, and are monogamous breeders. A number of species undertake annual migrations. A few species have been domesticated for agriculture, and many others are hunted for food and recreation. Five species have become extinct since 1600, and many more are threatened with extinction. 6-8 living species of black geese are known. In addition, one species has been described from subfossil remains found in the Hawaiian Islands, where it became extinct in prehistoric times. Another undescribed prehistoric species from the Big Island of Hawai‘i was extremely large and flightless; it is tentatively assigned to this genus due to being very peculiar. It is fairly certain that at least another species of this genus awaits discovery on the Big Island, judging from the facts that at least one species of Branta was found on every major Hawaiian island, and that remains of such birds have not been intentionally searched for on the Big Island. Several Canada Geese appeared at the top of a hill, quietly picking at the ice. Copious deposits of their feces were observed as well- but not pictured as to insure against the delicate sensibilities of the Lords and Ladies of the Newtown Pentacle being offended. This species is native to North America. It breeds in Canada and the northern United States in a variety of habitats. Its nest is usually located in an elevated area near water such as streams, lakes, ponds and sometimes on a beaver lodge. Its eggs are laid in a shallow depression lined with plant material and down. The Great Lakes region maintains a very large population of Canada Geese. By the early 20th century, over-hunting and loss of habitat in the late 19th century and early 20th century had resulted in a serious decline in the numbers of this bird in its native range. The Giant Canada Goose subspecies was believed to be extinct in the 1950s until, in 1962, a small flock was discovered wintering in Rochester, Minnesota, by Harold Hanson of the Illinois Natural History Survey. With improved game laws and habitat recreation and preservation programs, their populations have recovered in most of their range, although some local populations, especially of the subspecies occidentalis, may still be declining. In recent years, Canada Geese populations in some areas have grown substantially, so much so that many consider them pests (for their droppings, the bacteria in their droppings, noise and confrontational behavior). This problem is partially due to the removal of natural predators and an abundance of safe, man-made bodies of water (such as on golf courses, public parks and beaches, and in planned communities). Often are such Geese observed here at First Calvary, even during the summer. It’s odd, alongside the maligned Newtown Creek and within the walls of New york’s ancient burying ground, that there exists a sort of nature preserve amongst the tomb legions. All commercial airplane engines are required to pass a “bird strike” test before they can be certified for use. Engine manufacturers, including CFM International, which produced the engines on the US Airways Airbus A320 involved in Thursday’s sudden landing, test the engines physically and through computer simulation. In the physical tests, the engines are revved to full power inside a test facility and absorb various kinds of birds, from those the size of sparrows to those the size of herons, one at a time. (The birds are already dead.) The engines also ingest multiple birds meant to simulate a collision with a flock, said Matthew Perra, a spokesman for the engine manufacturer Pratt & Whitney. Hey, Mitch. Did you ever try getting a pair of snowshoes? I bought a pair 3 years ago from LL Bean. They’re great to klomp around in in high snow.